The Best Advice On When To Pick Banana Peppers Easily and Successfully! / The Best Advice On When To Pick Banana Peppers Perfectly! The Best Advice On When To Pick Banana Peppers Perfectly! You finally decided to plant your own banana peppers. You love them on salads and pasta and pizza and sandwiches! So, you’ve put in the time and work needed to grow and care for them in your yard and they’re now growing in bunches! You feel it may finally be that time to pick some and enjoy all that hard work! When Can I Pick Them? 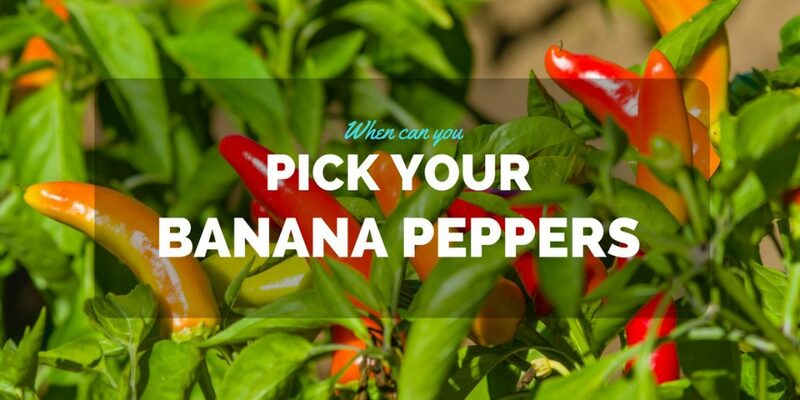 What If You Pick A Banana Pepper Too Early? You’re unsure, though. Are they ripe enough? Understandably so. There is much confusion about best time when to pick banana peppers and sadly, they’re most commonly harvested at an immature age. All those poor green peppers on sale! I had the same doubts and questions about mine and it took me a while, some research, and a lot of half-green half-yellow peppers until I learned. When is the best time to pick banana peppers? How do I know if they’re ripe enough? What if I want a sweeter flavor from my peppers? Simply put, you’ll have to consider their variety, color, size and the kind of flavor you’re looking for. There are two main varieties of the Banana pepper (Capsicum Anuum). One is the more common Sweet Banana pepper and the other is the spicier variety - The Hungarian Wax or Hot Banana. Both varieties take about 70 to 75 days to fully mature and like miniature versions of their namesake, the peppers will start turning yellow as they ripen. However, due to differing cultural conditions like colder climates, less-than-optimum soil, and the growth progress of each pepper, some may take more time to mature so be sure the check each fruit before picking. The 70 to 75-day timeline can then be used as a useful guide. This will be a good time to start checking your peppers for ripeness. Also, allowing the banana pepper to age further will increase the intensity of the pepper’s flavor. There is one drawback, though, when the fruit is allowed to mature further – the plant will yield less fruit in the long run. On the other hand, if you’d like a greater produce from your plants, then you should pick the fruit more often. The best time to start picking your banana peppers is when they’ve fully grown, having turned from a green color to yellow. Their size may vary depending on their variety. Let’s take a look at the two main types. The milder sweet banana peppers mature at a size smaller than the Hot Banana, typically growing 4 to 6 inches in length and 1 ½ inches in diameter. The banana pepper can be picked once it has reached its full size and has become completely yellow. The plant itself reaches 18 to 24 inches in height and width at maturity. If you’d want a mellow sweeter pepper, wait until it has turned completely red before picking. Note that this variety may not snap as easily from its stem as the Hot Banana. On the other hand, mature Hot Banana peppers would be about 6 inches in length and around 1 ½ inches wide. Like Sweet banana peppers the hot banana can be picked once it turns yellow, snapping quite easily from its stem. The hot banana pepper plant grows to maturity at 36 to 48 inches tall and 18 inches wide. This variety develops more heat as it matures to red so if you want a milder flavor, pick at the yellow stage. Red hot bananas are great for drying while yellows are more suitable for pickling or fresh use. Why not pick them at various stages then you can decide when they taste best! Now that you’ve found the peppers ready for picking, let’s look at how you’ll remove them from the plant. Instead of the usual hand-picking, which can damage the plant if done roughly, Use scissors, pruners, or garden shears. Soak a clean cloth in rubbing alcohol and use these to disinfect the equipment you will be using. Gently pull the plant to one side so the ripe peppers are easily seen and the leaves won’t be in your way. Then cut through the stem of the banana pepper, leaving about half an inch attached to the fruit. For faster picking, once the pepper is cut let it fall to the ground and collect later. Remember, picking often means more fruits to come from the plant! If handling the hot Banana variety, be sure to use gloves to avoid irritation. Avoid touching your eyes, mouth or nose when handling the hot peppers. Wash hands thoroughly before using them, even if you’ve been using gloves! Trust me, you wouldn’t want to feel that burning sensation like I did! If you accidentally get pepper juice in your eyes, wash immediately with clean running water. After you’ve collected those delicious ripe banana peppers, give them a proper rinsing and pat dry. If you’re not using the peppers fresh, they can be refrigerated for up to two weeks. If you have lots of pepper left over, freezing or pickling are good ways to store them as well.That’s going to be a lot of vitamins, fiber, and beta-carotene! Simple. Place the banana pepper on a south-facing windowsill so it can continue absorbing sunlight until it ripens to your desired age. If you see any signs of shriveling or shrinking, refrigerate immediately and remember to use them first. Now you’re all set to go picking banana peppers! 3. The fruit has turned from a green color to a yellow hue and has reached mature size. Sweet Banana – 4 – 6 inches long and 1 ½ inches thick. The redder the color means it’s sweeter! Hot Banana – 6 inches long and 1 ½ inches thick. The redder the color means it’s spicier! ​4. Use gloves for your hands, and garden shears to snip the fruit, leaving about half an inch of stem. 5. Prepare for deliciousness! Refrigerate, freeze or pickle any that’s left. Do you love banana peppers too? If you have any comments, tips, or questions for me let me know in the comment section below! Don’t be shy! Jean Andrews (1995). Peppers: The Domesticated Capsicums, New Edition. University of Texas Press. p. 97. ISBN 978-0-292-70467-1.